Two girls sat on a small, colorful carpet in the living room of their new house. The older one, a lanky seven-year-old redhead, sat up tall and poised, her feet tucked underneath her. The younger one, a chubby four-year-old with brown curls, was sprawled out on her stomach, paper dolls scattered around her. “Allie, play with me?” the little girl, Jessie, said. 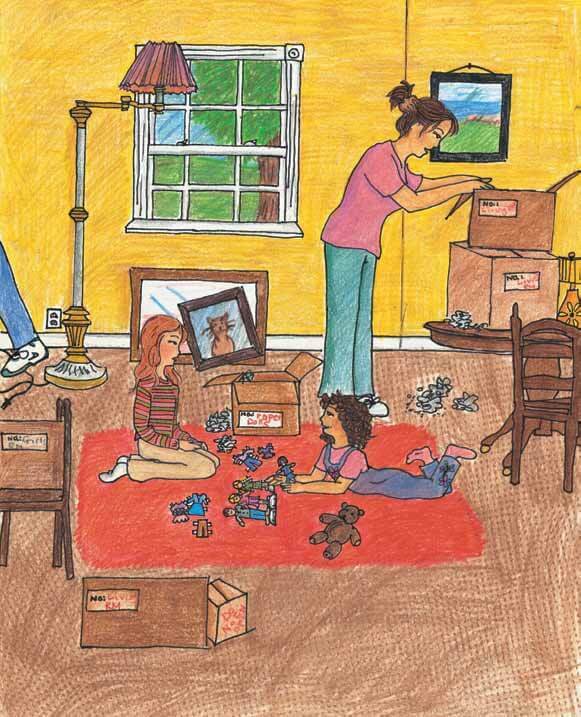 She was tired of all the moving boxes, and her parents’ distraction. Unfortunately, her parents loved moving and did it frequently, due to both their work, their spirit for adventure, and restlessness. But playing with her sister, the gorgeous, poised Allison, would make up for it. The little girl scrunched up her face in concentration. “Paper dolls,” she decided. “Um… Blueberry!” Jessie said, remembering the fresh, sweet berries they had tasted when they lived in Maine. “No. Blueberry,” Jessie said, still able to savor the sweet berry. “OK, Blueberry it is.” And so the Blueberry Family was born. 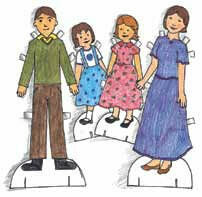 I kneel on the hardwood floor, peering into a moving box with the set of paper dolls we used as the Blueberry Family. Allison and I are helping unpack in our new Connecticut home. I take out the packet of paper dolls and smile as I hold it up to Allison. “Hey Allison, remember these?” I call out, but Allison continues unpacking. Silent. I sigh and look down at the packet. I had actually never forgotten the Blueberry Family, where I was the bossy older sister and Allison the cute younger sister. Allison and I shared a brilliant imagination despite our three-year age difference. The story we made up was magical: in the Blueberry Family’s world, Jenna and Andrea lived at a magic amusement park near a blueberry field with their parents. At night, after everyone had left the park, the Blueberry Family tried out all the rides and even slept on the Ferris wheel. 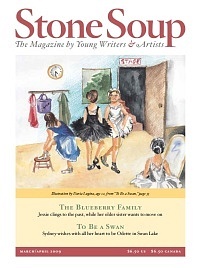 Sometimes Allison would draw pictures, illustrating our Blueberry Family stories. The Blueberry Family kept me stable through all our moves. I feel numb with hurt. True, I had seen it coming. The graceful, poised, child Allison has grown into an outgoing, social fifteen-year-old Allison, who isn’t interested in me. Once I had adored her, and that felt special, now it seems everyone adores her. Allison gets better and better at making friends, while I continually struggle to find just one. Worst of all, she’s too old for magic amusement parks and paper-doll families. One of the things I used to admire in Allison was her unique way of thinking, so unlike all the other kids her age. When she was nine, she told me that she never believed in magic as in flying, but magic as in friendship. Even as a six-year-old I recognized the wisdom and sophistication of the statement. But she hasn’t said anything like that for a while. I leave the room. She doesn’t seem to notice. “Jessica?” My mom looks over the staircase to see me. “Look at this house, Jessica. Can’t you just feel the spirit?” She takes a deep breath. Even though she says that every time, it gives me a boost just to hear it. Maybe Connecticut will be different. Maybe I’ll find lots of friends here, more than Allison. Maybe I’ll find a secret door leading to a magic amusement park… I’m not too old for those kinds of dreams. “Donna, you can’t promise that,” my father says, stepping over a moving box. The living room is cluttered with them. “Because of my job, and besides, that’s just the way we are,” Dad says. I sigh and edge back up the stairs. On the first day of school, I decide to bike there instead of taking the bus. I want to be away from the prying eyes of children who tease newcomers. “So I’ll see you later,” I say to Allison as I take my cereal bowl to the sink. “Right,” I say vaguely. I miss the days before “coolest” became part of Allison’s vocabulary. “Well, we are!” Mom cries. “What’s wrong with getting their hopes up?” Mom asks. Both of them have forgotten that Allison and I are in the kitchen too. I look at Allison, hoping to share an eye-roll, but she looks out the window. Wearing my backpack, I dash up the old oak tree right outside our house and find a comfortable spot. No one seemed to see me as I introduced myself in class, ate at an empty lunch table, and sat alone at recess. If we move again soon, away from this school district, I won’t mind. While I do my homework, I see Allison cross the street to a car in front of Lucille’s. I see her jump in the car, laughing and smiling, her jovial voice carrying across the yard. I see the car drive down the road, and, after about an hour, I see it come back. I climb down the tree and wait for Allison to finish waving and calling out to Lucille about future trips, et cetera, et cetera. Then I plant myself in front of her as she walks towards the house. I glare at her and notice her golden earrings, swaying in the breeze. I blink back tears. I just can’t let go of seven-year-old Allison, so willing and patient to give up her normal name of Smith for Blueberry. That isn’t the Allison who stands before me, shopping bags at her feet. “I’ve stopped caring now, Allison,” I say, surprised to hear how harsh my voice is. “Everything I once admired in you is gone. You aren’t what you used to be.” I turn and walk inside the house. Allison and I don’t speak to each other for over a week. Every time I see her, I feel a pang of regret for my outburst—I don’t want to lose her—and a pang of anger—how could she change so much? School doesn’t get any better. No one notices me, not even Lucille’s sister, the one my age. But my teacher, Ms. Carolyn, is nice. She gave us each a private journal to write in over the course of the year. I like to fill mine with my poems. It relaxes me. I hand in some of the poems for creative writing assignments, and they usually get A-pluses. Ms. Carolyn has also assigned a project for her class this year: to choose from a list of jobs to help around the school. I’ve volunteered to help with the younger kids in the after-school program. It’s a fun job. The little kids’ make-believe games are entertaining. Whenever I watch them, I think of Allison, and our fight, and the Blueberry Family. One day Allison leaves early for school. She and Lucille want to do something together before school starts. I don’t know what and I don’t really want to know, either. But inside I worry. What will Allison say when I approach her? At my elementary school, I lean my bike against a wall and look out at the many kids: running, shouting, giggling, chatting. Across the street, at the high school, I spot Allison with her friends. She still has her beautiful red hair and her poise. I look back at the kids at my schoolyard. I see some kindergartners and imagine how they will grow up, change, and become high-schoolers across the street. And I remember what Allison said: “You’re always holding onto what we did as kids.” But I can’t let those things go. We move so much. Everything changes around me. What’s wrong with holding on? Warily, I cross the street and approach Allison. “…so I decided to use soft tones here.” Allison holds open her sketchbook. She still draws? She almost drops her sketchbook. “Y- you forgot this,” I say, showing her the lunch bag. She puts away her sketchbook and takes it. I walk away. 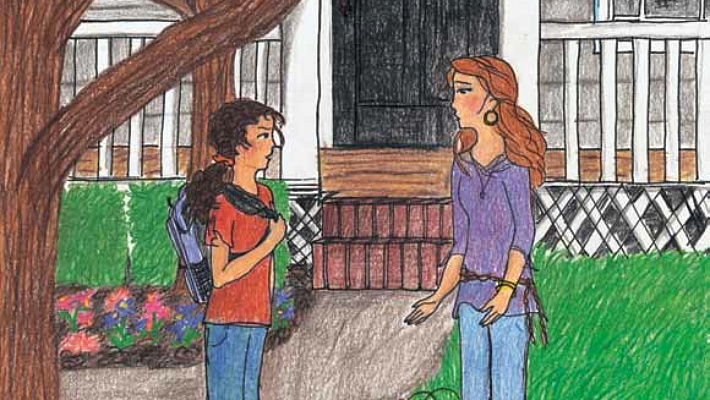 “I need to talk to you—in private,” Allison says. I look over at her friends. 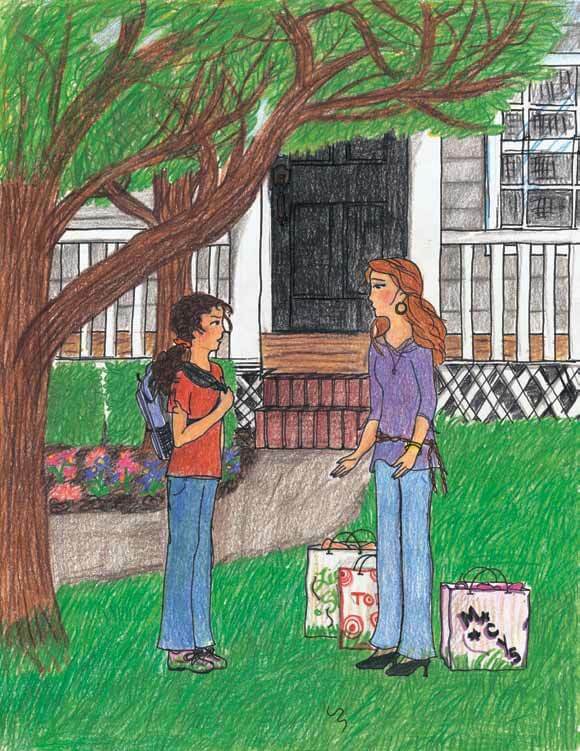 “Oh, everyone, can I just say something to my sister here?” Allison asks. “Sure,” Lucille says, as Allison leads me around the bend, away from her friends. “Um—what’s this about, Allison?” I ask, looking at the ground, at the jungle gym across the street, at my sneakers. “But I don’t want to change,” I said. I can’t help but smile. Allison hasn’t lost her wisdom after all. “So are you,” I say. “Well, see you around, I guess,” she says, and walks over to her friends. Squinting just a little, I can picture her kneeling on the floor, paper doll in hand. Then I open my eyes. I don’t need to see her as a seven-year-old anymore. That was then. This is now.